Xiaomi phones weren't the only thing which sold out within minutes in India, same thing happened to the Xiaomi accessories. I'm talking about official accessories of Xiaomi phones like Flip cases, Xiaomi piston earphones, official screen guards and Mi Power banks. These accessories were sold out like hot cakes and I witnessed this whole thing. Fortunately I was able to fetch two the official Xiaomi accessories; The official Mi3 screen guard and the Mi Power Bank 10400 mAh. Today I'm going to review the Mi Power Bank 10400 mAh and will tell you if it is worth buying or just another "bling-bling" accessory. I will write a separate article on the Mi3 screen guard and will publish it on the blog section of this site. I recommend going for a 10400 mAh variant as it's capacity is double and only charges 200 bucks extra, a steal deal. However it is difficult to get the 10400 mAh variant because most of the time it is 'Out of Stock' but if you are lucky enough then you may see the Buy Now button. For people who don't know, Xiaomi accessories are exclusively available on Flipkart in India, stay away from the counterfeit power banks which other websites are selling, buy your Power Bank from Flipkart only. 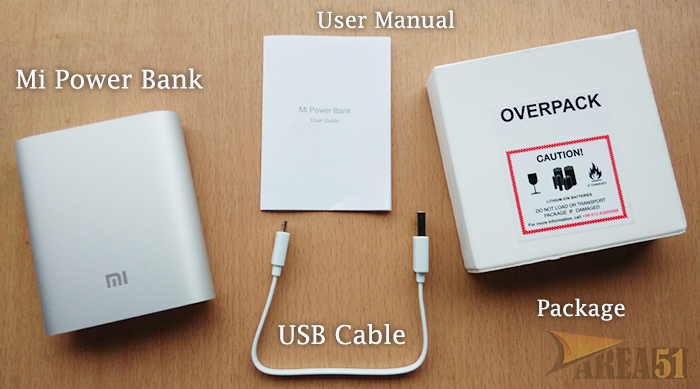 The box is pretty simple with not much branding, just a plain white small-box which holds the power bank. Inside the box you get the Mi Power Bank and a small microUSB cable for connecting the device. 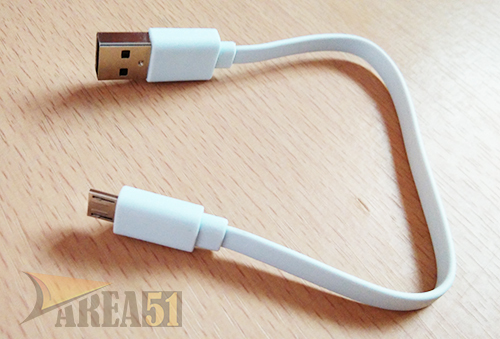 The cable is pretty small, approximately 9" inches long, has a USB port on one side and a microUSB port on the other. You also get a small manual with the Power Bank which contains the usage instructions and other functions. That's pretty much all with the unboxing, I'm surprised that the company didn't provide any adapter for charging your Power bank, you'll have to use your Xiaomi Mi3 charger or any other charger for charging your Power Bank. You can watch my Unboxing video to get a better view of box contents. Please Subscribe to our YouTube channel for more such videos in future. I'm really surprised to see such a high quality product at such cheap price. The Power Bank is really small in size and you can easily carry it around. The product has an aluminum frame which kinda gives it 'Apple' like look and feel. The Aluminium protective casing is a single-piece metal casing made by high precision CNC digital cutting and is water and corrosion resistant. It can bear the pressure of 50 kg which is quite impressive. The top and bottom is made of high quality plastic, overall the build quality is very good and premium. The front has a Mi logo which is shiny silver and does the branding job. The unit weighs around 250 grams, which is quite light for such capacity Power Bank. The top part has a large circular button which suppose to work as On-off button but works as Reset button. 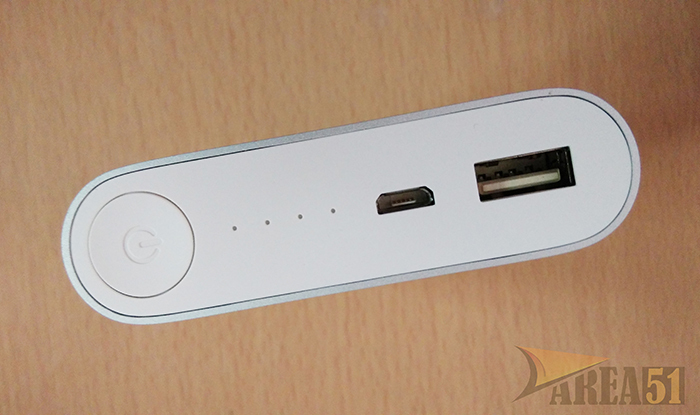 It has 4 Indicator lights which indicates the battery level of the Mi Power Bank. Each LED light indicated 25% battery and when all 4 LED lights are turned on and stable, we can understand that the Power Bank is fully charged. Top part also contains a USB and microUSB port. The bottom part contains large number showing the Power Bank capacity and other details about manufacturer. The Actual dimensions of the Power Bank are 90.5 x 77 x 21.6 mm. 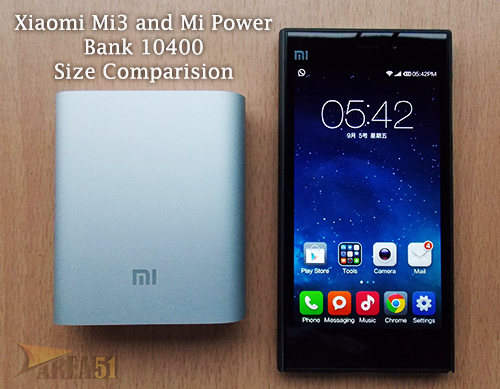 Below photo shows the Mi Power Bank 10400 with the Xiaomi Mi3, by looking at it you can have an idea about its size. 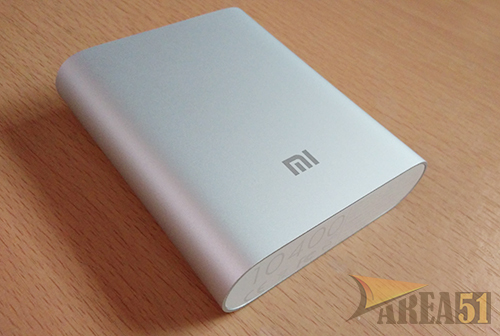 The Mi Power Bank has 4 LED lights on the top which work as the battery level indicator. To understand the indication, imagine each light as 25% battery and 4 of them equals to 100% battery. Below is a simple way to understand battery level. When you are charging a mobile phone or any other device with the Mi Power Bank the lights work in this manner. All Lights Off = It means the Power bank does not have any battery left. When you are charging the Mi Power Bank using the adapter, the lights work in this manner. 0-25% Battery Level = 1 Light Blinking and 3 lights turned off. 75-96% Battery Level = First, second, third light on, 4th blinking. This is pretty much all, you'll get it after using it for some time. The Mi Power bank is made of high quality circuits and batteries, It has World-Class chipset protection designed by Texas Instruments. According to the company, the USB smart control and power source chipsets are strengthened by nine layers of chipset protection which protects the motherboard and batteries in case of short-circuit, It also protects the Power Bank in case of over-voltage. The batteries used by the Mi Power bank are made by LG and Samsung, the names are enough to convince you to go for it. Not only that, the CEO of Xiaomi is quite confident about the technology and quality, he claims that each of its unit is insured by the PICC (People's Insurance Company of China) and each grantee slip can be claimed for $81,900 US dollars. Since the Power Bank uses dual cell technology from LG and Samsung, you get the quality and trust of such top brands. The cable which comes with the Power Bank is of very good quality and seems durable but it's quite short, a longer one wouldn't have hurt but again looking at the price, I can't complain. The 10400 mAh variant contains 4 Batteries of 2600 mAh each, made by LG and Samsung. Another good thing about this Power Bank is that it supports pass-through charging, this means that you can simultaneously charge your phone and Power Bank. The Power Bank will pass the charge to the device and once the device is 100% charged, it will charge itself. This type of capability is seen in top brand Power banks which are quite expensive as compared to the Mi Power Bank. The 10400 mAh variant of Mi Power Bank takes about 5.5 hours to charge fully and the 5200 mAh variant takes about 3 hours to charge fully. Mi Power bank will require about 4-5 Charge and Discharge cycles for reaching its maximum capacity. Initially you'll notice the Power Bank losing battery quicker than it suppose to be, but after 4-5 charge and discharge cycles it will reach its maximum capacity and you'll notice that the charge is staying for longer periods and the Power Bank will charge more devices. How many devices you can charge? After charging it completely, I charged a number of devices like the Xiaomi Mi3 (one time), Apple iPhone 4 (1.5 time), Samsung Galaxy Duos (1.5 time) and some more devices for short duration before it died. I will update this post after 5 charge-discharge cycles and will post the new results. Overall I will definitely recommend this Power bank to people who are looking for a budget accessory for their smartphones. This Power Bank looks premium and does the job very well, also you won't find anything like this at such a price. I mean what you expect for $17? You won't find anything with a whooping 10400 mAh capacity. This Power Bank would have been better if the company provided a carrying case or a bit longer cable, But again for $17 you simply can't complain. UPDATE: After 3 charge and discharge cycles on the Mi Power Bank 10400mAh, I was able to charge Xiaomi Mi3 two times and Apple iPhone 4 (1450mAh) upto 89% before the Power Bank died. This is roughly same as what the company claimed, since iPhone 4 has approximately half the battery capacity of Mi3. After testing Mi Power bank for 5 days now I'm satisfied with it. I will continues the tests and will post an update again after 5 charge discharge cycles. Let's see if the results improve.